A mysterious cargo ship appears off the shores of New York City. With no crew visible, it’s pulled into dock and a group of police investigate, led by Detective Tony Aris (Marino Masé). They find the hold is filled with giant green eggs. One of the eggs bursts and everyone who gets splashed ends up exploding from the inside. Detective Aris winds up quarantined and is press-ganged by a shadowy government agency to find the source of the eggs. Colonel Stella Holmes (Louise Marleau) and Aris discover the lone survivor (Ian McCullough) of a failed mission to Mars is connected to all of this, which then leads the team to South America and the source of the deadly eggs. 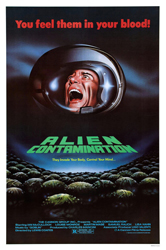 Looking at the cover, you would get the impression that Contamination is yet another Alien (1979) clone. Outside of the imagery of masses of eggs and bursting chests, there really isn’t much to connect this film to Alien. In reality it plays out more like a conspiracy film, with our heroes discovering piece by piece what the diabolical plot is, while enemy agents try and stop them. In this case just replace gun fights with flying guts, and an evil mastermind with a giant cycloptic Martian. Contamination wisely keeps things moving at a quick pace, there really isn’t a whole lot of plot here for a conspiracy movie. The conspiracy itself is fairly simple, and when things threaten to bog down, a standoff with the bad guys or a well-placed killer egg is introduced to liven them up again. The special effects are mostly successful, the numerous exploding chests are gore filled and messy, but the choice to always film them in slow motion reveals their flaws a bit too much. Actors wearing obvious rigs means you know who’s going to explode in any given scene, thus spoiling some of the excitement. Mars sequences are shot simply and effectively using washed out photography and miniatures. The Martian, although really great looking, is pretty much immobile and relegated to just sitting there, and mind controlling people into its mouth. McCullough and Marleau put in decent performances. They really help sell several over the top scenes, especially later in the film. Masé overacts wildly, gesticulating all over the place and his character is generally a bit of an annoying creep, so it can be agonizing when he’s on screen. The soundtrack by Goblin is superb, it’s catchy, sinister, and strangely funky even when it seems inappropriate for the scene… so, pretty much classic Goblin. I appreciate Contamination because it banks on using just a little bit of an established film’s imagery to draw you in and then delivers a completely different kind of experience. It doesn’t aspire to be a grand cinema; it just wants to deliver a plot that largely exists to get the viewer from one gore scene to the next, along with just a touch of action and some monster mayhem. It’s fun, gross and disposable. Not a great film, but TOTALLY agreed on how good the soundtrack is. The ending is SO confused, but still a lot of fun. Definitely drags through much of the middle of the film.